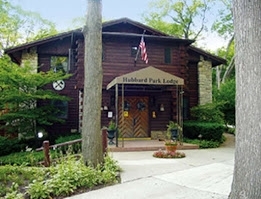 Hubbard Park Lodge is located in a beautiful park along the Milwaukee River. It is secluded and private, yet centrally located. The lodge's architectural details compliment its setting. The beautiful cathedral ceiling, stone fireplace, and balcony all offer a rustic, yet elegant facility for your special event. Hubbard Park Lodge is open to the public for Friday Fish Frys and Sunday Brunches. On all other days, we are available for wedding ceremonies, receptions, and private events.